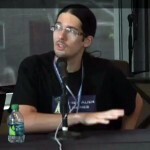 I recently attended Casual Connect 2011 in Seattle where I spoke on a panel about being indie hosted by Mark Baxter. Fellow panelists were Ola Rogula (Doll Divine) and Shane Neville (Ninja Robot Dinosaur). The panel was called “DIY: Indie Game Dev from Napkin to Profitability” and you can watch the whole video here. The sound volume is a bit low but if you turn it up it’s clear enough. Enjoy! Doing the panel was a lot of fun, plus I got a free pass to Casual Connect, which was awesome. Next week I’m on a panel at PAX Dev about being indie. You are currently browsing the Grey Alien Games weblog archives	for August, 2011.